STOCK MARKET STRATEGY FOR AUGUST 14, 2016: The stock market has reached the top of its trading once again by posting a new all-time high on Thursday. The market may back and fill for a few more days before making what I believe will be one more new high for this move. From that new high, we should see a more substantial correction in terms of price and time. That next correction will be a dip worth buying as it will likely come back to new all-time highs once again. THE BOTTOM LINE: We are in a neutral internal market, but at the top of the trading range. We can expect the market to either pause before making a new high this week or else push forward with a series of new highs on weakening strength. That should set-up a correction over the next few weeks and present a low risk buying opportunity for another ride up to new highs. So expect the market goes into a correction after a push to new highs this week that will become a buying opportunity worth betting on a few weeks from now. Note: Another sign of a top is a key reversal on high volume where the market opens up strongly, reverses in mid-session, and then closes convincingly on the downside. This unique sentiment indicator shows that the stock market is grossly over-loved at this time by blogger/stock market advisors. That means, an investor/trader should be very careful if they’re betting on the long side now. 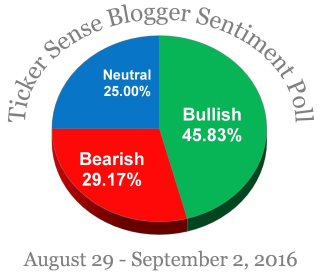 With market history as an indicator and the tendency of sentiment gauges being contrary indicators, the bullish party may be over soon. My experience with this indicator is that it tends to have about a one-to-two week lead time before the market reacts. 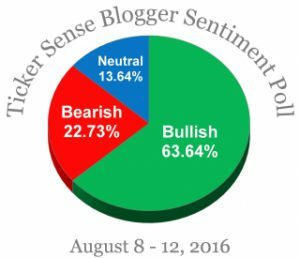 In the present case, the market should top out in a week or two according to this indicator. STOCK MARKET STRATEGY FOR JULY 31, 2016: The stock market has been chewing up time and consolidating its gains from the Brexit lows. The internal indicators show that the general market is within reach of oversold readings. This presents an interesting situation where the price levels would appear to be too high, but the internal market shows that it’s getting set up for more upside. At the very least, I’d expect a retest of the previous highs and show us clues of either strength or weakness. Until then, the market can go in either direction with equal probabilities. THE BOTTOM LINE: The stock market is in a position to go in either direction. A good case can be made for each. I’d expect another quick test of the previous highs with the anticipation of weakness on that retest. 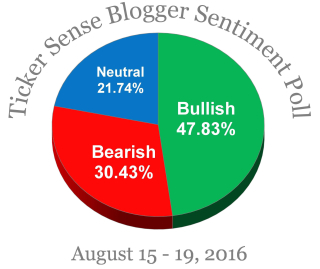 This would set up a correction in mid-to-late August that most traders would want to avoid holding long positions. But at this time, there doesn’t appear to be good high-probability trading opportunities for either long or short major market indexed positions. STOCK MARKET STRATEGY FOR JULY 23, 2016: The stock market continues to push higher making new consecutive closing highs. The Dow ended up with 7 new highs in a row before backing off the last two days. A new closing high may signal the point of exhaustion if it is not confirmed by strength in other major indices. From there, we could start the decline to correct the advance from the February lows. This means that further strength should be sold into while buying needs to wait for the next oversold condition. THE BOTTOM LINE: The stock market appears to be near the point of exhaustion, but not in a way that a prudent trader would want to short. The most likely scenario is for the markets to chew up time by backing and filling in terms of price action. That type of market behavior would frustrate most traders and investors. So while we may not go up much from here, it doesn’t mean that we’re headed straight down either. I would advise stepping aside and waiting for the market to set itself up for the next big move in whichever direction it chooses. STOCK MARKET STRATEGY FOR JULY 17, 2016: The stock market has made 4 consecutive new closing highs in the Dow Jones Industrial Average. This leg of the rally is near the point of exhaustion meaning that a dip or correction is likely to occur soon. With the majority of indicators in neutral positions, the general market can still go in either direction. But it would be smarter to wait in order to take on new positions. The momentum is clearly on the bullish side so buying the dips is the optimal trading strategy. THE BOTTOM LINE: The stock market washed out all the pessimism on the Brexit panic which left the market with only one way to go and that was up. If that Brexit bottom was in fact a cyclical low, the market from a time perspective has a lot more time to advance. The next similar bottom is most likely several weeks away. While it may be tough to buy here, it would be smart to wait for a dip and add new positions then. Otherwise, you can wait for a better bottom in the fall even if that should occur at higher prices. STOCK MARKET STRATEGY FOR JULY 4, 2016: The stock market was an amazing roller coaster ride is past week. In the end, the internal indicators that I follow most closely are all a few days away from becoming overbought. This means that there is a little more room to the upside (100-300 DJIA points), but most likely it’s too late to buy. Instead, use near-term market strength to lighten up positions with a likelihood of a better low-risk entry point later in the summer or early fall. THE BOTTOM LINE: The stock market proved to be a tricky place to be last week after two straight down days were followed by 4 straight up days. With this kind of volatility, you certainly don’t want to be on the wrong side of a trade. Right now, we are not anywhere close to an entry point so one should hold their positions and look to sell overbought/overvalued positions. It will take some time in order to set up for another buying opportunity. For most swing traders, this is a time to sit out. Note: Previous closing highs for the Dow Jones Industrial Average were 18312 in May 2015 and 18096 in April of this year. A final closing DJIA between those marks should probably mark the end of this rally from the February 2016 lows. STOCK MARKET STRATEGY FOR JUNE 27, 2016: The stock market had a sharp rally on Thursday followed by an even sharper decline on Friday. This left the internal indicators with neutral readings trending down. This means that the decline has more to go on the downside with a bounce expected soon. But overall, the market is more likely to decline for some more time in order to create the necessary shift in sentiment that is critical to forming an intermediate term bottom opportunity. But for now, anticipate central bank manipulation to create a wild ride on Wall Street. THE BOTTOM LINE: The stock market needs some more time in order to reach an oversold tradeable bottom. The soonest that could happen would be the week following the 4th of July holiday. Until then, it may be smarter to detach yourself from this market as a period of wild moves can be expected this coming week as Central Banks try to instill confidence in an unstable global market. I’d guess the July 11th plus or minus one day is about the time market rallies again. This rally could be sharp, tricky to catch, but highly profitable for those who can bet wisely. STOCK MARKET STRATEGY FOR JUNE 20, 2016: The stock market has reached oversold conditions in all of the internal indicators that are followed here. But be careful about committing too much to the long side at this time. Expect lots of volatility in the coming week with the news coming out of Britain. I would expect false moves in either direction with the end result being the formation of an overall topping formation. But for the nimble, a little more weakness could lead to another trip to challenge the previous highs. THE BOTTOM LINE: The stock market may produce a short-term bounce or a period of volatile up and down action. Expect the political news from Britain to provide the backdrop to some wild action over the next two weeks. As a trading strategy, I may go long on a move to the 200-day moving average of any of the major indices. It would only be as a short-term trade to play the bounce.